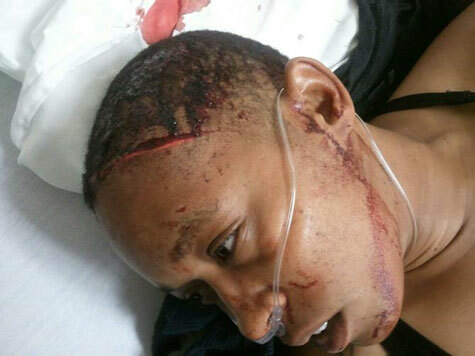 Kayla Elliott suffered a head wound requiring 18 stitches, and defensive wounds to both hands in the August 14 attack..
MIDWEST CITY, Okla. — An Oklahoma lesbian was attacked this week after months of anti-gay slurs and verbal harassment escalated into a brutal assault. 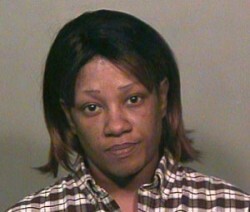 Kayla Elliott, 29, who has been caring for her sick father in the Oklahoma City suburb of Midwest City, said she has been harassed for months by a woman who resides in the apartment above her father. But on Tuesday evening, those ant-gay slurs escalated into a vicious attack. According to Christina Garcia, a friend of Elliott’s, Maxwell took a swing and initiated a physical altercation. After the fight had been broken up, Elliott retreated from the confrontation and into her father’s apartment. After seeing the blood coming from Elliott’s head, witnesses called the police and separated the two. Maxwell was arrested at the scene and taken into custody; she was held on $5,000 bond for probable cause of assault with a deadly weapon. Maxwell, whose arrest record dates back to 1992 where she has multiple previous arrests for DUI, possession charges, actual physical control charges, and forcible entry, claimed she was acting in self-defense. Elliott, who suffered a head wound and received 18 stitches, is petitioning the District Attorney’s office to elevate the current charge to attempted murder. The Gayly is an Oklahoma City-based LGBT monthly.